The formal word for eyes is 目 (mù). In ordinary speech we call the eyes 眼睛 (yǎnjing). The eyebrow also takes on the “eye” radical. It is called 眉 (méi) or 眉毛 (méimao). 看 (kàn) and 瞧 (qiáo) both mean to look or to see. 盼 (pàn) is to look forward to, or to long for. 睁开眼 (zhēng kāi yǎn) is to open the eyes, as when one wakes up in the morning. Tā bù zhēng kāi yǎn. He will not open his eyes. In the following sentence, 不 (bù not) is the adverb associated with 开 (kāi). This results in a different meaning. Tā lèi de zhēng bù kāi yǎn. He is so tired he cannot open his eyes. 眨 (zhǎ) is to blink. Tā xiàng wǒ zhǎ zhǎ yǎn. 打盹 (dǎ dǔn) is to doze off. 睡眠 (shuì mián) means slumber. It is used as a noun. 瞎 (xiā) and 盲 (máng) both mean to be blind. These words are often used as adverbs to describe how things are done haphazardly or without purpose. According to an old English proverb, the eyes are the window to the soul. Yǎnjing shì línghún zhī chuāng. The song named 窗 (chuāng Window) expresses this idea through some cute verses and a lilting melody. Click on “Show more” to see the lyrics in Traditional Chinese characters. You can find the lyrics in Simplified Chinese characters here. 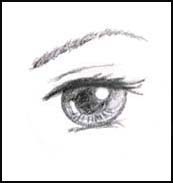 会说的眼睛 (huì shuō de yǎnjing) means eyes that can talk. 含有 (hán yǒu) means to contain. 多少 (duōshao) can be construed as either “how much” or “quite a bit”, depending on the context. Here it is used to indicate that the eyes convey quite a bit of feelings. 情意 (qíngyì) is tender affection or goodwill. In the context of this song, 相对 (xiāngduì) means facing each other. 欲言又止 (yù yán yòu zhǐ) is a commonly used expression that describes how you have something to say but hesitate because of shyness, concern for the consequence of saying it, or some other reason. In the second stanza, the singer tries to make out what this pair of affectionate eyes is really trying to say. Is it an encouragement, 鼓励 (gǔlì)? Is it a revelation, 启示 (qǐshì)? Is it the glory of life, 生的光辉 (shēng de guānghuī), or is it the seed of love, 爱的种子 (ài de zhǒngzǐ)? According to an old English “proberb”, the eyes are the window to the soul. should be “proverb” I guess. 2. the character 盼 appears without its pinyin pronunciation. Thanks for pointing out the errors so they may be corrected.